I like pretty, shiny things. So pretty, shiny kitchen things really send me. There are 'morning people' and there are 'night people,' but there are no '4 o'clock in the afternoon people' without this baby! 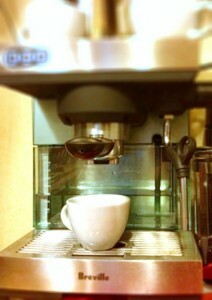 My Breville IKON espresso machine is usually the first pretty, shiny thing I visit each morning. And since I use my iPad to notate my recipes, Orville gave me an under-cupboard iPad mount so it floats in front of my face–a pretty, shiny, floating, high-tech kitchen thing. I love it! But recently, I was introduced to a new pretty shiny thing: the Bob Kramer Chef’s knife from Shun, the Japanese knife manufacturer. For those of you who are saying “What? Who? Why?”, let me explain who Bob Kramer is. Bob is a Master Bladesmith who specializes in kitchen knives. His knives are amazing works of über-functional kitchen art–super-sharp, and amazingly beautiful. OK, just take a look at his knives here. Stunning, right? I want one. Bad. Unfortunately, there is a list to get into the LOTTERY to get him to make a knife just for you. And then, a Chef’s knife will run you about (and I’m guessing here, as he doesn’t list prices) around $10,000. Ten. THOUSAND. Dollars. For A knife. I think I will not be getting one anytime soon. Or ever. But Bob has partnered with some great knife manufacturers (Zwilling and Shun) to reproduce his designs exactly. And that’s what I was introduced to last month in my weekly (sometimes bi-weekly) sojourn to Sur la Table. The Shun Bob Kramer collection. I like to buy knives at SlaT because they keep a big bowl of vegetables and a cutting board on their display case so you can test drive any knife in the place. When the nice knife guy handed me the 8 inch chef’s knife, it gleamed. No, it glowed. Like Excaliber. 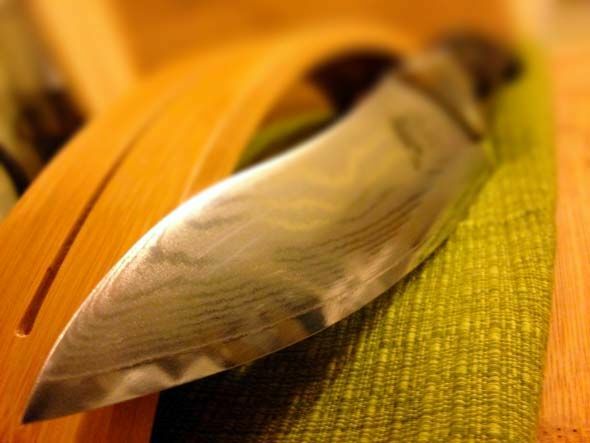 I was mesmerized by the waves of Damascus steel undulating across the blade. I selected a sweet potato and sliced. Before I even started, the potato was cleaved in half. I’d hardly touched it, I swear. But there was the Shun Bob Kramer gleaming in the center of that potato. This was sharp in a way that made me want to count my fingers. I proceeded to reduce one of the halves into translucent slices. It was like surgery with a very big scalpel. The other half, I transformed into match-like slivers, and then sweet potato confetti the size of pin heads. I was hooked. I kept my workhorse knives, a sturdy set of Henkels and a Furi santoku, plenty sharp, but nothing like this. 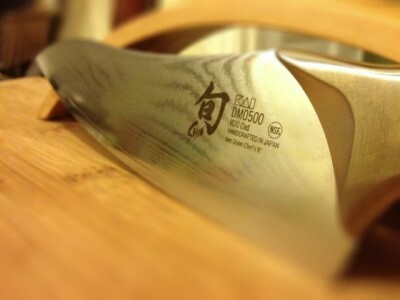 I learned that Western style knives have an edge bevel of 20 degrees, but Eastern style knives, like Shun, have an edge of only 15-16 degrees. Only four or five degrees difference, but oh what a difference it makes! These things are like enormous razor blades [more on this later – see the Epilogue*]. They are also still expensive. The 8″ chef’s knife goes for $340. Ack! Still well out of my reach. But then I had a little residual windfall on New Year’s Eve. I had the means for a splurge, and i decided that a wicked sharp knife would be just the thing. A knife like that, I’ll use it every day for the rest of my life, i rationalized. I began weekly to visits to what I was now calling ‘my babies.’ Luckily, I never saw the same knife person twice, so they all took me through the finer points of the blade composition as I decimated their veggies. Finally though, I decided that even with the means, $340 was still a lot for me to spend on a knife. I decided instead to thriftily bring my knives in to S al T for a good professional sharpening. Of course, while I was there, I chatted with yet another super nice knife expert [I’ll call her Kerri], this time lamenting my decision not to get the Kramer. ‘Had I tried any of the other fine knives by Shun?’ Kerri asked as she watched me slice a carrot into translucent medallions. Of course, I had in the past, but I’ve always found their handles just don’t fit my hand. Watching me slice, she said ‘I have something I think you’ll l Iike.’ and she turned to the case behind her and pulled out another pretty, shiny knife. The Shun 'Ken Onion' 8" Chef's knife... hmm. Shiny. As I tore through the carrot, Kerri continued to prepare my knives for sharpening. I picked up my Furi. It felt like it was made of tin foil. I handled my Henkels chef’s knife. It felt awkward and small and somehow (though it has seen me through years of every cutting task I put it to) inadequate. I looked back at the pretty shiny knife on the cutting board. What was this thing? I picked it up and felt the same thrill. I looked at the sticker on the blade. It was $150 less than the Kramer knife. It felt like it was made just for me. Note the layers of steel creating that beautiful pattern. Pretty. “I’ll take it.” I heard myself say the words before I formed the thought. My face flushed with what I’d just done. Was I really going to do this? “The answer came immediately up from my subconscious. “Yes.” And I knew it was right. I felt my eyes moisten and went a little lightheaded. Kerri laughed. “That’s perfectly OK. You know, the wand chooses the wizard.” I appreciated the reference. And, honestly, the moment was a tad bit magical. “Congratulations.” She said it as if I’d just gotten engaged. The rest is history (barely, as this all happened on MLK Day). I left my knives to be sharpened (I’m on my way to pick them up as I write this) and went home with my pretty, shiny new Shun Ken Onion 8” Chef’s knife. 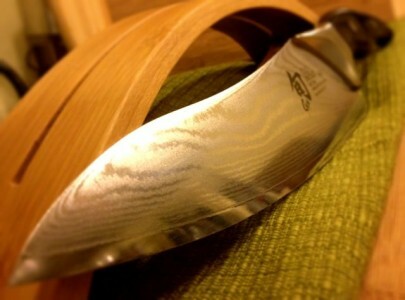 Turns out that Ken Onion is a master Bladesmith who does NOT do kitchen knives. Nor is he a chef. But Shun asked him to design the perfect chef’s knife. So he filmed chefs at work, studying them and their cutting techniques and habits, finally designing a knife to perfectly match their needs. And then Shun made it. And it chose me. And now my arm is complete again. Epilogue: Well, my limbs aren’t as complete as they were yesterday. This is what I get for showing off! 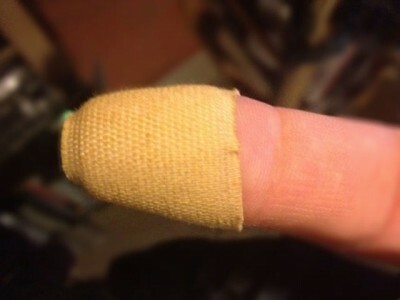 While showing off my baby (to someone on the phone, no less), I managed to slice a sliver of skin off my fingertip! Like a razor through butter, it slipped just a tiny bit in my hand and shaved off a bit o’ me fingertip, quick as you please. BE CAREFUL! These Shun knives are WICKED sharp, and they take no prisoners!